BEIJING (Reuters) -- Renault and China's Dongfeng Motor Group have signed a framework agreement on a joint venture, a senior Renault executive confirmed on Monday. The move is another a step toward the French automaker's goal of assembling cars in the world's biggest auto market. The joint venture with China's No. 2 automaker would have an annual capacity of 200,000 to 300,000 cars, Katsumi Nakamura, Renault's director of China business operations, told reporters at the Beijing auto show. "We signed a memorandum of understanding in March," Nakamura said, adding the two sides still have to reach a final agreement before submitting the plan for official approval. He offered no time frame for when production might start. "We're going to start with one vehicle at a smaller capacity and build up" to the eventual full capacity production, he said. According to sources, the deal would include plans for joint production of vehicles including an electric car and an SUV. Renault is lagging behind its main rivals in China, where European market leader Volkswagen is the dominant foreign carmaker. Renault's 80 Chinese sales outlets sold a little more than 24,000 imported vehicles last year, the bulk of them Korean-made Koleos SUVs. The French automaker has been in talks for months with Dongfeng, which already builds cars in a joint venture with Nissan, Renault's Japanese affiliate. Renault is preparing a "major industrial investment" in China, CEO Carlos Ghosn told reporters on April 5. Ghosn, who also heads Nissan, had said earlier in the year that the French automaker aimed to begin manufacturing vehicles with Dongfeng in 2014-2016. 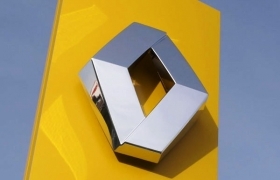 Renault and Dongfeng are also examining industrial cooperation opportunities with the Dongfeng-Nissan venture, a source said. The older partnership assembles SUVs on a similar underlying vehicle architecture to that of the Koleos. The French automaker is negotiating with Dongfeng to produce its vehicles in Dongfeng's assembly plant in the central China city of Wuhan, China's official Xinhua news agency reported in February. The French automaker also plans to sell its vehicles through Dongfeng's Aeolus-brand dealerships, the wire service added, citing Dongfeng sources. The plan will allow Renault to begin local production without building its own assembly plant. It also would allow Dongfeng to make better use of its assembly plant, according to Xinhua. Dongfeng's plant can produce 120,000 vehicles a year. But sales of Dongfeng's Aeolus brand fell 6 percent to 26,028 units last year, according to market researcher LMC Automotive.